Unwanted audio ambience may be generated if working in ‘untreated’ acoustic environments when recording and this naturally affects the quality of any signal captured via microphone. Six years ago se electronics were the first company to develop a solution to this commonplace problem and launched the highly successful reflex ion filter RF pro. We are proud to announce that recently se electronics were awarded a us patent for the design standard and this applies to all se electronics reflex ion filter products including the brand new RFX. Patent no. Us 8,191,678. With RFX anyone can capture great sounding vocal recordings anywhere. 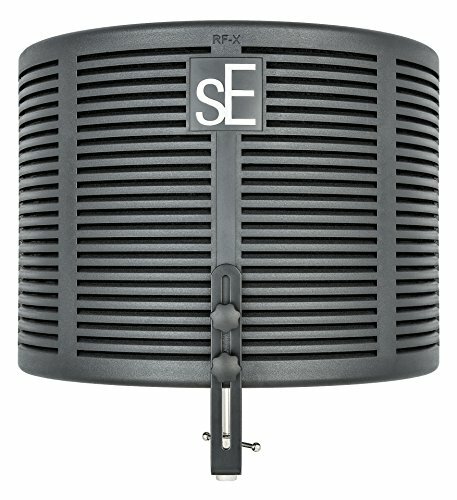 Available today the SE electronics RFX is the latest high performance acoustic filter joining SE ’s highly acclaimed line of successful and industry standard reflex ion filter products. Using the same us patented design technology as the the new RFX has been conceived to answer the needs of the discerning recording artist working on a budget. With a new lightweight body and redesigned lightweight clamp assembly the RFX is simplicity itself, providing unbeatable performance and ease fuse. New materials have been developed to make it lighter than its predecessors but also to maintain it’s durability helping to position RFX as a versatile product suited for any challenging working environment. It features a four layer acoustic filter design comprising the outer composite panel itself, a wool fabric layer, an air gap layer and an inner acoustic foam layer. This multilayer design with air gaps differentiates the RFX from its competitors by helping to ensure that recordings exhibit almost zero sound coloration when using the filter. The RFX clamp assembly also utilizes a new lightweight design allowing it to be used on almost any microphone stand. It has been simplified to achieve this and allows vertical mounting only making it the perfect solution for vocal recording. If you have any questions about this product by RFX, contact us by completing and submitting the form below. If you are looking for a specif part number, please include it with your message.